PJ, here. 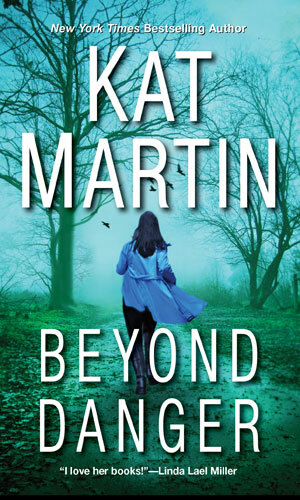 I read Beyond Reason, the first book in Kat Martin's Texas Trilogy in one sitting when it was released last spring. I could not put it down and have been looking forward to book two, Beyond Danger ever since. Kat Martin sure knows how to keep me on the edge of my seat! Beyond Danger is Beau's story. Mega-rich, black-haired, and blue-eyed, Beau is gorgeous to look at, and flashy. He was an amateur race car driver, sort of a Texas Paul Newman, before he left the racing circuit. Beau loves fast cars and fast women. That's where private investigator, Cassidy Jones, comes in. She's smart and she's no pushover, exactly the woman for Beau. Best of all, she's determined to prove his innocence. Beau could hardly believe it. His father was sixty years old! The girl sitting across from him in a booth at the café looked like a very pregnant teenager. Running a hand over his wavy black hair, Beau took a steadying breath. He had always wanted a sibling. Now at the age of thirty five, he was finally going to have one. He felt a surge of protectiveness toward the young woman carrying his father’s child. Hell, he was worth more than half a billion dollars. He would see the baby girl had everything she ever wanted. Leaving money on the table for the coffee, he followed the women out the door. By the time he climbed out of his Ferrari in front of his father’s house and pushed through the front door, his temper had reached the boiling point. “Dad! It’s Beau! Where are you?” He strode down the hall toward the study. “Dad!” Still no answer. Steeling himself for the confrontation ahead, he shoved open the door. His father wasn’t sitting behind his big rosewood desk or in his favorite chair. Beau started to turn away when an odd gurgling sound sent the hairs up on the back of his neck. “Dad!” Beau spotted his father lying on the floor in a spreading pool of blood. The handle of a letter opener protruded from the middle of his chest. “Dad!” Blood oozed from the wound and streamed onto the hardwood floor. Beau had to stop the bleeding and he had to do it now. Praying he wouldn’t make it worse and with no other options, he grabbed the handle of the letter opener and jerked it out. The shapely brunette didn’t pause, just pulled out her cell and dialed the emergency number. Beau’s hand shook as he checked for a pulse, found none. The stab wound was catastrophic. No way could his father survive it. And when he looked at Cassidy Jones, he realized she thought he was the man who had done him. Are you reading Kat Martin's Texas Trilogy? She's in my tbr pile and looking forward to starting one of her series. I've read several of Kat's books. I always end up reading them straight through because if anyone can leave you hanging on the edge of your seat it's Kat Martin. She's very good at it, isn't she? I have read different series by this author. The novels are exciting and intriguing. Did you know she also wrote historicals back in the day? Kat Martin's books provide me with an escape. I haven't started this series, but I did enjoy Kat's Brodies of Alaska books. I liked the Alaska books too, cheryl! I know that this is a longtime author, but I have not read any of her books. I went on a historical jag, then paranormal jag before cutting my reading with some contemporary and just a bit of suspense. I have a long way to go before reading all of the authors I want/intend to read. Believe me, Lil, you're not alone. There are so many authors out there about whom I've heard wonderful things but there are only so many hours in the day. I have read Into the Fury. She writes some books that will keep you on the edge. I haven't started her new series. I have not read one of her books recently, but I do know she is a talented author who develops a terrific story. I have read her books before and liked them. Hadn't heard about this series though. I will definitely check it out. I am reading the Texas Trilogy and can't wait to get my hands on this one! I have almost all her books and I love, love them. I'm looking forward to reading Kat's books. Thanks for the chance! I really enjoyed Kat's Against .... series, but haven't started this Texas trilogy yet. Kat Martin has been a favorite for years. I started with her historicals and loved them. I followed her to her paranormals and her suspense books. No matter what the sub-genre they are all well worth reading. I currently have a backlog of her books on my TBR mountain, so no, I haven't started the Texas trilogy yet. From the sound of BEYOND DANGER, it is going to be sooner. Just finished Beyond Reason. 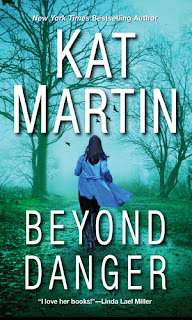 Kat Martin's romantic suspense are among the best. Looking forward to the next one. Haven't read this trilogy but have read other books by kat. I've read several of her historicals but none of her contemporaries have made it off my tbr yet. I have not read this new series. But I'm a huge fan of Kats books. I love her historical and contemporary. I've read Kat's historicals and enjoyed them.